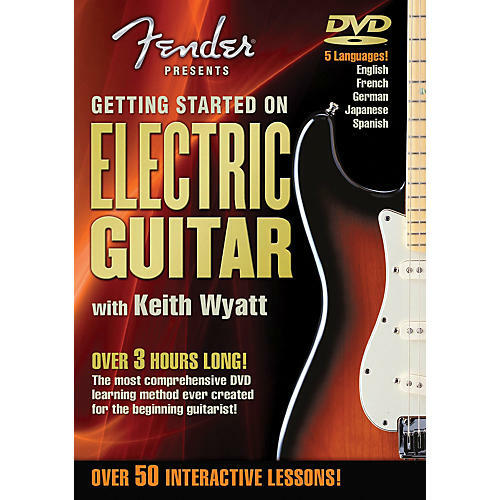 The Hal Leonard Fender DVD Package - Getting Started On Electric Guitar offers a complete course for the beginning electric guitarist. Step-by-step lessons incorporating clear, easy-to-follow 3-D graphics and unique play-along tracks teach the viewer the essential chords, scales and techniques used by electric guitar players in every popular style, including rock, blues and country. This DVD is separated into two major sections. Part 1 - The First Step covers: tuning methods • string names • essential chords and scales used by all players • musical reference section (notes, rhythms, chords and scales) • practice tips • fretting-hand technique • picking-hand technique • backing tracks for play-along • an animated fretboard • & more. 102 minutes. Part 2 - Play Electric covers: right-hand technique • left-hand technique • rhythm parts (muting, alternate picking, arpeggios) • soloing technique (string bending, vibrato) • rock, blues & country styles • rhythm and solo ideas for each style • backing tracks in each style for play-along • sounds (amplifiers and effects) • caring for your instrument • and tips from the Fender Custom Shop. 100 minutes. Bonus footage, including a tour of the Fender factory! Universally coded for playability worldwide. Total running time: approximately 225 minutes - over three hours long!